MySpace is no longer a cool place to socialize when compared to Facebook and Twitter. 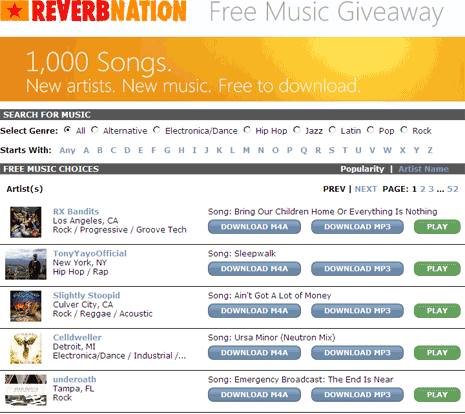 Well, it might get new love from users wanting to download new music, new songs (simply put – 1000 free songs download). Windows @ MySpace (myspace.com/windows) is out with this music giveaway in association with ReverbNation. Head over to Windows page at ReverbNation [via] and preview songs available for download. You can download any song in MP3 and M4A format from that listing. Here is little bait, for continued and updated information on latest music addition – add Windows @ MySpace (myspace.com/windows) as your friend and keep the free music flowing – interested?